Personalized Roped Pen Holders For Around The Neck -Corded Pen Holders, Custom Printed in Bulk. Promotional, Very Cheap. Pens not included. Bulk personalized roped pen holders and blank wholesale roped pen holders at the lowest prices in the USA and Canada. Comes with breakaway lanyard for safety. Have the convenience of always having your logo (and pen) handy and visible during the work day. 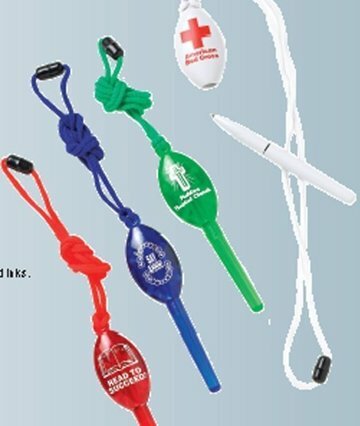 Perfect for the healthcare industry or for tradeshow giveaways. Free artwork design. We will send you a proof for your approval before production. Prices include your 1-color custom imprint. Blank (not imprinted) pen holders cost $0.39 each (minimum 250). SET UP CHARGE: $35.00 per side. $25.00 on re-orders. SECOND SIDE IMPRINT: Add 0.25 per piece. PACKAGING: Bulk; add $0.05 for individual polybag.